Dead wood (dead trees, branches, stumps and roots in all stages of decay process) plays an important role in element cycling (carbon, nitrogen, water, etc.) and builds-up forest nutrient stocks. 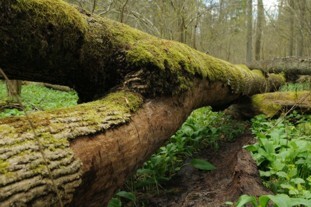 Dead wood is also an essential structural component of forests, providing habitat for large variety of organisms with often highly specialized habitat requirements (e.g. xylobiontic beetles). Organisms inhabiting dead wood cause change in wood quality (its structure, chemical composition and density) preparing substrate for consecutive steps of ecological succession. Speed of this change depends inter alia on wood species and on organisms colonising it. 5th (almost decomposed) –log shape oval to flat, wood structural integrity lost, its texture soft, powdery when dry and red-brown to dark brown in colour. Both dead wood quantity and quality (size, class of decomposition) as well as its chemical and structural diversity are assumed to be linked to tree species richness. In the scale of ecosystem, variability of nitrogen content in dead wood usually decreases with increasing species richness, which could be explained by more constant and continuous dead wood delivery because of the wider range of species longevities and disturbance susceptibilities. Nitrogen content in fresh wood depends on tree species and local soil fertility. Usually it is below 0.1% of dry fresh wood biomass. Although itself low in nitrogen, by hosting the nonsymbiotic bacteria carrying nitrogen fixation, dead wood may be a significant contributor of nitrogen in forest ecosystems. Efficiency of this function is relatively high, leading to manifold increase of nitrogen content with progress of wood decay process. Besides activity of dead wood dwelling N-fixing bacteria increase of nitrogen content may be explained by relocation of this element by fungi from substrates (mineral soil and decomposing biomass) outside the log. Thus dead wood serves as nitrogen accumulator, storing this element for plants which will develop on it after its complete decay and mitigating post-disturbance nitrogen loss. As stand species diversity influences dead wood diversity (species, size, decay class) it influences stability of nitrogen stocks stored in forest ecosystem and time of its retention. Dead wood is a long-term pool and potential source of nitrogen for the next tree generations. Its role as a N sink for a long periods may possibly diminish N leaching after harvesting. Thus forest management should consider leaving some standing and downed dead wood at logged sites to mitigate rapid nitrogen loss during regeneration phase of forest life cycle.